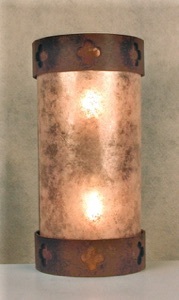 The "Bernard" light is similar to the Julia, but made with a more decorative band which is copied from designs at the client's house. Because the ceiling was low, they were made as semi- flushmounts rather than hung from chains. They are lit with LED bulbs.